Mahmoud Ahmadinejad's sacking of foreign minister Manouchehr Mottaki has opened another chapter in the ongoing power struggle between the president and the supreme leader, Ali Khamene'i. Interpersonal as it may seem, this confrontation symbolizes the struggle between the Islamic Republic's old elites and Ahmadinejad's burgeoning patronage network, which challenges their authority. How has the president managed to build such a formidable power base? Who are the key members of his coterie, and will they enable their benefactor to outsmart the supreme leader to become Iran's effective ruler? Was Khamene'i the Real Target? The sacking of Iran's foreign minister, Manouchehr Mottaki, on December 13, 2010, was a clear snub to Iran's supreme leader, Ali Khamene'i, and opened another chapter in the ongoing power struggle between him and President Ahmadinejad. On December 13, 2010, while the foreign minister was on an official visit to Senegal, Ahmadinejad replaced Mottaki with Ali-Akbar Salehi, former Iran Atomic Energy Organization director. Following the public outrage about dismissing a cabinet minister on a diplomatic mission, "an informed source" claimed that the government was unaware that Mottaki was abroad. 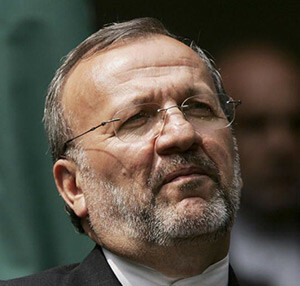 But upon release of the news that Ahmadinejad himself had ordered Mottaki to deliver a personal message to the Senegalese president, first vice president Mohammed-Reza Rahimi and senior assistant Mojtaba Samareh Hashemi said that Mottaki had been informed of the dismissal prior to the trip—a claim which the foreign minister denied. A model career diplomat, Mottaki was never a key player in the Islamic Republic regime and owed his cabinet membership to Khamene'i. This, along with newly revealed information about the circumstances of his sacking, provides insights into Ahmadinejad's real target: the supreme leader. According to Ayandeh News, approximately a week prior to Mottaki's dismissal, Ahmadinejad had privately complained to Khamene'i of "lack of coordination between [government] agencies and [the presidency's] restricted authority" and had voiced his resolve to replace the foreign minister. No decision was made, and Ahmadinejad did not raise the issue on his next meeting with Khamene'i on December 6, 2010. However, upon leaving the supreme leader's office, the president told one of Khamene'i's secretaries that "he had forgotten to raise the issue of Mottaki's dismissal with Ayatollah Khamene'i and asked him to inform him [Khamene'i] about it." Khamene'i has hitherto failed to comment on Mottaki's dismissal in public but gave the green light to various foes, such as parliamentarians and the press, to criticize Ahmadinejad. He also opened another front against the president as the judiciary announced it was investigating corruption charges against Vice President Rahimi. But as Ahmadinejad ignored the public outrage, Khamene'i took a defensive position. According to Ayandeh News, in a conversation "with one of the grandees," Khamene'i stressed that "Mottaki's dismissal had not been coordinated with him and that his approval had not been sought concerning appointment of the acting foreign minister [Ali-Akbar Salehi]." The sacking of Mottaki continues a relentless purge begun during Ahmadinejad's first term in office. Upon entering the presidential palace in 2005, he faced the same challenge encountered by all his predecessors: Though the president has the prerogative of appointing cabinet ministers, more often than not, these appointments are imposed on him by the regime's ruling elites. Ahmadinejad, however, has moved away from the political traditions and elites of the past and has systematically purged those cabinet ministers forced on him by other groups, beginning with the roads and transportation minister, Mohammed Rahmati, whom he had inherited from his predecessor, President Mohammed Khatami. From the camp of Ayatollah Ali-Akbar Hashemi-Rafsanjani, Ahmadinejad dismissed economy and finance minister, Davoud Danesh-Ja'fari, and oil minister, Mohammed-Kazem Vaziri Hamaneh. He even dismissed cabinet ministers imposed on him by Khamene'i, including interior minister, Hojjat al-Eslam Mostafa Pour-Mohammedi, and intelligence minister, Hojjat al-Eslam Gholam-Hossein Mohseni Ezhehi. Other ministers dismissed by Ahmadinejad were cooperatives minister, Mohammed Nazemi Ardakani; education minister, Mahmoud Farshidi; industry and mines minister, Ali-Reza Tahmasbi; and welfare and social security ministers, Mohammed Nazemi Ardakani and Parviz Kazemi. Mottaki's dismissal—the first purge in Ahmadinejad's second tenure—eliminates any pro-Khamene'i and pro-Ali Larijani representatives in the cabinet since the foreign minister was active in Larijani's 2005 presidential bid. They did not easily allow anyone to join their team … They had to be completely convinced that this person thought the same way as themselves and to be convinced of his loyalty before allowing him to join their ranks. They would also make investigations, and even then would be careful. Ahmadinejad has not changed much since his university days. His network is recruited from a closed circuit comprising his fellow IUST alumni, local government and security executives who served in the northwestern parts of Iran in the 1980s, Islamic Revolutionary Guard Corps (IRGC) officers who received civilian academic degrees from IUST in the 1990s, those who served Ahmadinejad during his brief tenure as Tehran mayor (2003-05), along with a few family members, and some high ranking IRGC officers who seem to have a power base independent of Ahmadinejad. To find the roots of Ahmadinejad's circle of trust, one must look into the political dynamics at play at Iran University of Science and Technology on the eve of the 1979 revolution. It was there that the future president's road to radical politics began and where he forged the most important friendship of his life with Samareh Hashemi, his fellow IUST student, religious mentor, and political strategist. Unlike Ahmadinejad, who hails from an unprivileged family of immigrants to Tehran, Hashemi belongs to the religious upper-middle class in Kerman province, is the nephew of Islamist theoretician and prime minister, the late Mohammed-Javad Bahonar, and is also the uncle of current parliamentarian Mohammedreza Bahonar. In the immediate aftermath of the revolution, Hashemi and Ahmadinejad headed a radical Islamist student faction at IUST, following the line of "the late [Ayatollah Ali] Ghoddousi, representative of the leader's deputy [Grand Ayatollah Hussein-Ali Montazeri] at the IUST," unlike the other faction which followed the "representative of the leader at the university." Hashemi and Ahmadinejad's group suffered a major setback at the November 1979 seizure of the U.S. embassy in Tehran. Inspired by the late Ayatollah Mohammed Beheshti, the Islamic Republican Party cofounder, their faction had opposed the takeover. Beheshti himself had held secret negotiations with U.S. diplomats a week before the seizure and was not interested in the release of the documents, instead advocating the takeover of the Soviet embassy. But the seizure of the U.S. embassy and the taking of U.S. diplomats as hostages proved a tremendous success for the perpetrators. Envious of the prestige of the leftist hostage takers, Hashemi and Ahmadinejad readily aligned themselves with the rightist revolutionary faction, especially the Islamic Republican Party. They established the Office of the Consolidation of Unity Student Organization and together with the late party firebrand, Hassan Ayat, set in motion what became known as the Cultural Revolution, namely, the closure of universities in Iran for over a year, the purge of Iranian universities of undesirable academics and students—including Marxists—and the rewriting of academic materials according to the Islamic Republic's ideological and political doctrines. The Cultural Revolution did not prove the astounding success Ahmadinejad and Hashemi had hoped for, and its management was soon handed over to the Supreme Council for the Cultural Revolution. The two students abandoned university life in pursuit of further revolutionary adventures in the shadow of the Iraqi invasion of Iran in 1980, but they allegedly swore to their leftist opponents, "We will return to conquer the country!" The Northwestern Ring. The path to conquest went through executive and security positions in the northwestern parts of Iran, which at the time was in a state of civil war—either because of ethnic conflict over Kurdistan or political upheavals as a result of Grand Ayatollah Mohammed-Kazem Shariatmadari's rivalry with Grand Ayatollah Ruhollah Khomeini—which challenged central government authority. Ahmadinejad himself served as governor of Makou and Khoy and advised the governor generals of Kordestan Ardebil. His colleagues from this era, known as the "Ardebil ring" (perhaps better called the northwestern ring), are heavily represented in Ahmadinejad's second cabinet. These include Hashemi, who served as West Azerbaijan governor general and Kordestan's political deputy, and who is today a senior assistant to Ahmadinejad; Esfandiar Rahim-Mashaei, Ahmadinejad's chief of staff, who established the IRGC intelligence unit in Kurdistan and was promoted to the local security council of the West Azerbaijan province; first vice president Rahimi, who served as Kordestan governor general; housing and urban development minister, Ali Nikzad, who was Ardebil governor general; welfare minister and former commander of the Revolutionary Guards, Sadegh Mahsouli, who served as West Azerbaijan deputy governor in the early 1980s, and Martyr Foundation director, Masoud Zaribafan, who is a relative of Ahmadinejad's and served as Mahabad governor and also on the Tehran Islamic City Council when Ahmadinejad was mayor. The Science and Technology Ring. Following the end of the Iran-Iraq war, many former Revolutionary Guards officers pursued academic studies to prepare themselves for public office. So did Ahmadinejad and Samareh Hashemi who returned to the university. Back at IUST, they kept the university's doors wide open to friends they had made in the Guards and security services in the northwestern parts during the war. In the 1990s, the IUST developed into a veritable PhD factory for the Revolutionary Guards, which explains the over-representation of IUST and IUST/IRGC alumni in Ahmadinejad's cabinet. The list includes commerce minister, Mehdi Ghazanfari; industry minister, Aliakbar Mehrabian, who is also Ahmadinejad's nephew; labor and social affairs minister, Abdel Reza Sheikholeslami; and roads and transportation minister, Hamid Behbahani. The Tehran Municipality Ring. Ahmadinejad's tenure as mayor of Tehran proved as important to his network as his university days and executive posts in northwestern Iran. Prominent Tehran municipality personalities of his coterie include recently sacked National Youth Organization director, Mehrdad Bazrpash; science and technology deputy, Nasrin Soltankhah; and industry minister, Aliakbar Mehrabian. Parallel with the rise of Rahim-Mashaei, came a meteoric rise by former Mashaei subordinates at the Tehran municipality during Ahmadinejad's tenure as mayor. Hamid Baghayi, Iranian cultural heritage handicrafts and tourism organization director, is the most prominent among Mashaei's protégés. Apart from those guardsmen who are somehow related to Ahmadinejad, there are also a number of IRGC officers who do not seem to owe their appointments to the president's benevolence and may well be the choice of the Revolutionary Guards. The list includes former IRGC Quds Force members, cabinet secretary, Majid Doustali, and defense and armed forces logistics minister, Ahmad Vahidi. Apart from Hashemi, Mehrabian, Mahsouli, and Sheikh al-Eslami mentioned above, other former IRGC officers in Ahmadinejad's second cabinet include communications and information technology minister, Reza Taghipour Anvari; cooperatives minister, Mohammed Abbasi; culture and Islamic guidance minister, Mohammed Hosseini; education minister, Hamidreza Hajibabayi; energy minister, Majid Namjou; interior minister, Mohammed-Mostafa Najjar; oil minister, Masoud Mirkazemi; and science and higher education minister, Kamran Daneshjou. The strong cabinet presence of former IRGC officers who have a shorter acquaintance with Ahmadinejad, and who neither belong to the northwestern ring nor owe their civilian academic degrees to Ahmadinejad and Hashemi, has important implications. It suggests that Ahmadinejad has had to reciprocate the IRGC's contribution to his reelection. Increased IRGC participation in the country's economic life and its seizure of publicly-owned economic enterprises—such as Iran Telecommunications in the largest trade in the history of the Tehran Stock Exchange—is another price Ahmadinejad has had to pay to remain in office. Ahmadinejad's sacking of Mottaki is the latest example of his systematic purge of political rivals and their replacement with his own protégés, so as to make the cabinet cohesive and relatively easy to control. At the same time, this patronage network excludes members of powerful elites who have ruled Iran since 1979, and who will consequently feel free to criticize the president since they are not involved in the decision-making process. No less importantly, the move constitutes yet another public snub to Khamene'i, who seems unwilling and unable to protect his own protégés, thus opening the door to his further weakening. Is Khamene'i ready for a showdown with Ahmadinejad, or will he continue to watch his prestige crumble amidst his rival's provocations? Regardless of the outcome of the power struggle between the two, a third party could be the ultimate victor: the Islamic Revolutionary Guard Corps, whose power will only grow as the civilian politicians continue their war of attrition. Ali Alfoneh is a resident fellow at American Enterprise Institute. Tabnak News Agency (Tehran), Dec. 13, 2010. Khabar Online (Tehran), Dec. 19, 2010. Farda News (Tehran), Jan. 1, 2011. Ayandeh News (Tehran), Jan. 2, 2011. Parsineh (Tehran), Dec. 13, 2010; Mehr News Agency (Tehran), Dec. 13, 2010; Kayhan (Tehran), Dec. 14, 2010. Asr-e Iran (Tehran), Dec. 20, 2010. Ayandeh News, Jan. 2, 2011. Aftab News Agency (Tehran), July 7, 2008. Fars News Agency (Tehran), Apr. 4, 2008. Now-Andish News (Tehran), Aug. 19, 2007. Farda News, May 17, 2008. Tabnak News Agency, July 26, 2009. Aftab News Agency, Oct. 28, 2006. Fars News Agency, Aug. 8, 2007. Hamshahri (Tehran), Nov. 18, 2006. Aftab News Agency, Sept. 25, 2006. Radio Farda (Prague), Dec. 14, 2010. "President Appoints Professor Mowlana as Advisor," President of the Islamic Republic of Iran website (Tehran), Aug. 19, 2008. Mahramaneh News (Tehran), Jan. 19, 2011. Shahrvand-e Emrouz (Tehran), Nov. 13, 2007. Ebtekar (Tehran) Apr. 16, 2008. See, "An Ayatollah Condemns an Unjust Ruler," Middle East Quarterly, Spring 2010, pp. 73-6. Shahrvand-e Emrouz, Nov. 13, 2007. Tabnak News Agency, Apr. 23, 2008. "Negahi Be Tarikhcheh-ye Showra-ye Ali-ye Enghelab-e Farhangi," Secretariat of Supreme Council of Cultural Revolution website (Tehran), accessed Jan. 3, 2011. "Zendeginameh," Presidency of the Islamic Republic of Iran website (Tehran), accessed Jan. 3, 2011. "Mashaei Yek Moemen Va Yek Modir-e Velayat-Madar Ast," Masha News (Tehran), accessed Jan. 3, 2011. Mardomsalari (Tehran), Apr. 22, 2008. Fars News Agency, Aug. 21, 2009. Jahan News Agency (Tehran), Nov. 8, 2009. Alef News Agency (Tehran), Mar. 4, 2007. Islamic Republic News Agency (IRNA, Tehran), Dec. 16, 2009. Ham-Mihan News Agency (Tehran), May 7, Aug. 23, 2009. Jame'-ye Eslami-ye Karegaran-e Esfahan (Isfahan), Aug. 25, 2009. For a survey of Ahmadinejad's tenure as Tehran mayor, see Frederic Tellier, "The Iranian Moment," Policy Focus, no. 52, The Washington Institute for Near East Policy, Washington, D.C., Feb. 2006. Ham-Mihan News Agency, May 10, 2009. Fars News Agency, Sept. 21, 2009. Ham-Mihan News Agency, Aug. 23, 2009. Mahramaneh News, Jan. 11, 2011. "Tabarshenasi-ye Koudetachian," Enghelab-e Eslami Dar Tab'id (Paris), accessed Dec. 8, 2009. Tabnak News Agency, Sept. 1, 2009. "Mo'arrefi-ye Mohandes Reza Taghipour Be 'Onvan-e Vazir-e Ertebatat Be Majles," Ministry of Information Technology and Communication website (Tehran), Aug. 21, 2009. Jam-e Jam (Tehran) Aug. 29, 2009. "Hamidreza Hajibabayi Kist?" Kanoun-e Farhangian-e Esfahan website (Isfahan), Nov. 13, 2009. Tabnak News Agency, Nov. 8, 2009. Ali Alfoneh, "The Revolutionary Guards' Looting of Iran's Economy," Middle East Outlook, American Enterprise Institute, Washington, D.C., June 2010. Related Topics: Iran | Ali Alfoneh | Spring 2011 MEQ receive the latest by email: subscribe to the free mef mailing list This text may be reposted or forwarded so long as it is presented as an integral whole with complete and accurate information provided about its author, date, place of publication, and original URL.